SCI-FI/PARANORMAL/THRILLER: Something horrific has happened to the small Russian city of Podol’sk and the potential for the same fate t o befall the rest of the planet grows exponentially as time goes by. Disgraced research professor Beau Walker becomes part of a scientific team tasked with discovering the cause of the destruction and a way to prevent it from happening again…“The Shiva Syndrome Trilogy” is a riveting, page-turner, right from the start! The story draws from diverse sources such as science, parapsychology, and theology and fuses them into a cohesive narrative that is as thought provoking as it is exciting. It boggles the reader’s mind to consider all the careful research that went into this novel. Definitely a labor of love, Mr. Joshua considers the story from multiple perspectives of opposing dogmas and fuses them in a beautifully coherent original theism…Brilliantly written and researched, fans of science fiction and the paranormal will find “The Shiva Syndrome” a fantastic read. Readers who love a story with multiple twists and turns and turn-the-page excitement will also love this book. A mind ben ding, philosophical, science fiction thriller, The SHIVA Syndrome is the debut release from author Alan Joshua and it’s sure to grab your attention. Books like this don’t find their way onto the shelves very often and when they do they tend to stand out because they don’t fit the usual genre paradigms and people take notice. Joshua’s release is certainly in that vein. With rich narrative threads that he exploits to the fullest it’s riveting from the start, whilst Beau Walker is one of those eclectic protagonists who readily resonates with the reader. Pace and plot feel exactly right, which given the scope of his theme is quite an achievement, and when the last page is turned it’s likely to leave you deep in thought. More importantly there’s a wholly pervading sense of authenticity which in the main comes from Joshua’s exacting eye for detail. He revels in the complexity of his tale as he weaves converging plot lines together, but every piece of information is there and flawlessly meshes together as he leads us toward a powerful and well-crafted denouement that will linger in the memory for days to come. 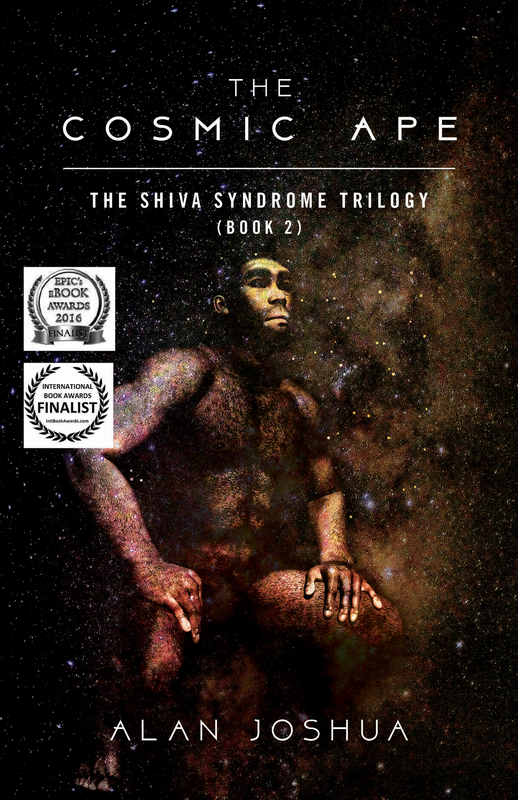 One of the most engaging, thought provoking and genuinely entertaining books you’re likely to read this year, The Shiva Syndrome Trilogy is a must read for fans of this ever popular genre. More importantly though, it heralds the arrival of Alan Joshua and raises high expectations for his future releases. It is recommended without reservation. THE SHIVA SYNDROME: SCIENCE FICTION OR SOMETHING ELSE? One gets the feeling from the subjects mentioned in the book, shamanism, The Stargate Project, the frequently strange goings on at Ft Meade, Jim Channon’s First Earth Battalion, hemi-synch technology and experiments at the outer edges of consciousness, that this might also be a handbook describing what could actually happen should science and technology succeed in expending the limits of what is possible in terms of consciousness and how this might intersect with our perceived ideas about reality. Best book ever! Needs to be a movie!!! Must read for your sci- fi/fantasy library now! The Shiva Syndrome is in the top 10 books of the best sci-fi/fantasy books I have read in over 40 years and I read over 200 books a year! It has everything I love in a sci-fi and fantasy in one book and makes it flow seamlessly and naturally. Very scientific, very mystic, very action packed, edge of your seat, who is who, and who is WHAT action. This is a book for any sci-fi fan! I hope a director like Steven Spielberg , James Cameron, or any other great sci-fi director will read this book because this is worthy of a movie! The plot is full of surprises and fast moving with lots of twists and turns. The characters are well developed and complex. There is no putting this book in a certain category, it stands by itself. It is thought provoking and intriguing. Don’t miss out. I reviewed this book for NetGalley and I am so glad I had the chance or I might not have picked it up, don’t miss out! After a Russian mind-research project opens a black hole in a Moscow suburb, researcher Beau Walker is coerced into joining the ensuing investigation. He soon realizes that anomalies worldwide–including the loss of an American space shuttle and a bizarre personal experience–coincided with the Podol’sk singularity. As events escalate, Walker embarks on an epic journey to come to terms with his personal demons, even as he struggles to save humanity from itself. In The SHIVA Syndrome Trilogy, the author (a clinical psychologist) skillfully and ingeniously interweaves altered states of consciousness and parapsychology with genetics, paleontology, mythology, and religion to produce a frightening, brisk, and film-worthy story building to an intense climax. The story challenges conventional notions of reality, ultimately concluding that human consciousness extends well beyond the flesh–and offers enormous potential for both creation and destruction. I’m enjoying it immensely. I find the treatment of parapsychology (and other sciences) to be sophisticated and sufficiently plausible to make for very good reading. The arguments on philosophical topics are also stimulating. I second Stan’s (Krippner) recommendation. What a fascinating book! It’ll magnetize you just like the penetrating gaze of Hindu’s god Shiva and his animal companion on the book’s cover, although the relation of this god of destruction and creation to the book’s topic is symbolic. The SHIVA Syndrome Trilogy is a sci-fi thriller, a mystery that unfolds on a background of myths and religions, biotechnology, military power, politics, and paranormal human abilities…The author’s profound knowledge of this field is shown in the extraordinary development of the story. The descriptions of events and characters are very vivid and engaging. Having the right amount of adventure and romance this crisscrossing genre tale isn’t just a good read, but may also look great on a big screen. At first glance one would think this to be either a sci-fi saga or perhaps a thriller: technically, that’s correct; but it’s so much more. Its focus on untapped human potential gone awry in a deadly experiment also lends to its enjoyment by new age readers or any interested in the paranormal – and let’s not forget the reader who enjoys political intrigue and a bit of spiritual reflection in their reading. Lots of action, intriguing concepts, and examinations of belief systems and the greatest opportunity in human history to reshape the world: that’s the essence of a powerful saga in The SHIVA Syndrome Trilogy, which is not only highly recommended ‘as is’, but would translate well to the screen. Lots of action, intriguing concepts, and examinations of belief systems and the greatest opportunity in human history to reshape the world: that’s the essence of a powerful saga in The SHIVA Syndrome Trilogy…Highly recommended. Any attempt to describe the book in a single statement is difficult, but the book mixes uncommon palettes and manages a masterpiece with it. If The Andromeda Strain was analyzed in four dimensions, The SHIVA Syndrome Trilogy might be the result. Such a base comparison is an overall disservice to the unique nature of this book, however. It is a surprising, suspenseful, and utterly superb read from start to end, facing modern mindsets with past, present, and future thinking all at once. [If] I had to categorize it, I would say it is a metaphysical thriller, while knowing that it truly falls under many genres… The SHIVA Syndrome Trilogy is a thrilling read, and I could definitely imagine this in the theater. The author is skilled at putting the pictures in your head without confusion. You find yourself connecting with his characters so that you are vested in their outcome. Would love to see a part two! Highly recommended. Mythology, spirituality, science, politics, genetics, mind-control, military action, paranormal human activity -there is so much going on in this book! I was absolutely captivated from beginning to end, and by captivated, I mean held hostage, as my life was literally put on hold until I finished reading. Not a fast or easy read by any stretch of the imagination, I’m so glad it was a rainy weekend or I might have felt guilty – maybe. The writing is impeccable. Theories and facts are well researched and explained with great attention to detail, and straightforward enough for the non-scientific mind. The characters are authentic, well defined and persuasive in their roles. The pace was fast-moving, the plot suspenseful and invigorating. Alan Joshua breathes new life into the sometimes predictable genre of science-fiction. Actually, he doesn’t stop there as the story seems to span across many genres, from sci-fi to fantasy to mystery/thriller, action and adventure, and a small (minute) dose of romance for good measure! I highly recommend “The SHIVA Syndrome Trilogy” by Alan Joshua for enthusiasts of all genres, as there is definitely something for everyone in this fascinating story! Beau Walker is a man with an interesting internal conflict. Born to a full blooded Native American father and African-American, evangelical mother/healer, he struggles to accept his heritage. He rejects his parents’ wishes, and relies on solid scientific reason to comprehend his inner distress. When Walker is coerced into joining an experiment in Moscow, the suspense element in the story scales up from this point on, taking readers into an unprecedented, gripping journey. Joshua deftly combines science and spirituality, and the result is an enthralling transcendent mind trip. The story line has twists that you won’t see coming. Joshua brings everything to life with his adroit narrative, making the story believable and highly readable. On the whole, The SHIVA Syndrome Trilogy is a page turning, sci-fi thriller. The notions proposed in the story are thought provoking and will linger in readers’ minds long after they put down the book. The mentioned possibilities of what the human mind can do are both fascinating and frightening. In essence, this is an enigmatic spiritual endeavor that I highly recommend to my fellow readers. In The SHIVA Syndrome Trilogy by Alan Joshua, we are thrown right into the action with the prologue. A test subject is in a liquid filled cylinder in a basement laboratory in Podol’sk in Russia. During the procedure, he experiences a seizure and chaos ensues in the laboratory. When everything settles down, all that remains in the tank is a formless, featureless black cloud. The cloud totally engulfs everything and disappears, leaving nothing but a massive crater. A team is quickly assembled to investigate the incident and the strange crater. Among these is Beau Walker, psychologist and empath. It is obvious that something very unusual has occurred in Podol’sk. What the team finds and experiences will shock, surprise and amaze you. As events escalate, Walker embarks on a journey dealing with his personal demons and must struggle to save humanity from itself. An engrossing read! Alan Joshua cleverly interweaves various genres. The story is extremely well written, well researched and well-paced, and will keep you turning pages till your eyes close of their own accord. A wonderful read that I would love to see being made into a movie! Here we have a crafted science fiction thriller, full of detail that defines its scientific plateau…Joshua ‘shows his working’ in a way Asimov might have been proud of, bringing this plethora of scientists around a table to discuss the intriguing science and pseudoscience of the novel. The vision is enthralling, building a fantastical concept from a multi-faceted discussion of the world’s experts as they travel by plane to Russia to investigate the disaster site. I highly recommend this fascinating tale to every reader. There is no way a readers will ever be bored with all of the mystery, intrigue, and adventures waiting for them inside Shiva Syndrome. From the first page and onward readers will be wowed for a long time to come. I enjoyed reading this unique and well written book by Alan Joshua. I am definitely looking forward to the next debut novel by this writer. Overall, I rate Shiva Syndrome a five out of five stars. The SHIVA Syndrome Trilogy is a sophisticated novel in which Alan Joshua creates a consistent mix of heterogeneous elements. For this reason, it doesn’t seem targeted to fans of a specific genre but in general to people seeking stories of some complexity that can be intriguing and mentally stimulating. The SHIVA Syndrome Trilogy was a phenomenal read…Many things develop every chapter and a lot of ideas and theories are constantly suggested involving complex thinking and understanding. The story was amazingly developed to keep the reader attentive and on their toes constantly and always guessing where the plot is heading up until the very end. Highly recommended for anyone interested in science fiction, mysteries and thrillers – you won’t be disappointed! This is a gem of a book, and is very much recommended. The SHIVA Syndrome Trilogy written by Alan Joshua is one of those books that managed to completely surprise me in the positive manner – a combination of thriller and mystery delivered in non-typical way will grab your attention and will not loosen its grip to the very last page…Alan Joshua with his debut succeeds in making a well-made novel, creating an untypical story and the intriguing world, combining SF, mystery and thriller motives. The author especially made a good job when it comes to the development of story making impossible for reader to guess in which direction the story will continue while the end of novel is nearing. 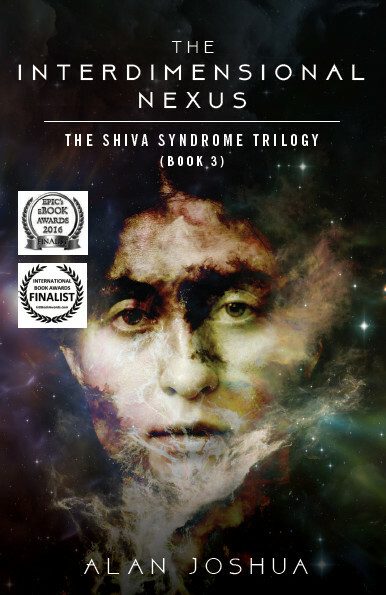 Therefore, with ‘The SHIVA Syndrome Trilogy’ Alan Joshua managed to overcome my expectations, kept me intrigued until the very end and because of that I can heartily recommend his title to the general audience. Let’s get straight to the point: The SHIVA Syndrome Trilogy is one of the best-written stories I’ve read in years. It’s rare to even see a book that combines science fiction and spirituality effectively, especially when the very nature of reality is thrown into the mix as a major theme…Most authors have tended to avoid mixing mysticism with their science fiction, much less adding in the Clancyesque thriller elements that Alan Joshua includes here. The result is an easily readable, believable, and above all human story. It’s a big story (in more ways than one), but I guarantee, once you get into it, it won’t last long. You’ll gulp it down and go looking for more. That’s how good this story is. I am not a science fiction reader, but I love mysteries and thrillers. The Shiva Syndrome Trilogy kept my attention from beginning to end. The mystery element is very well done and I could not wait to see where the story went next. As much a mystery as science fiction, the story never slowed down; and even though it’s a big book, I read it in a little over a day. Admittedly, I’m a fast reader…I’m glad I chose The Shiva Syndrome as my first book to review on Goodreads. It’s always nice to start off with a bang! Take a look — Alan Joshua’s story and complex characters will draw you in, and keep you thinking about the story a long time after you finish reading it. Two thumbs up! This was a thrilling book. A mystery of mind boggling proportions that not everyone is going to figure out. At the crux of this story is a government program that has gone haywire. This, by itself, shouldn’t be anything new, but the problem with this program going bad, is that it could destroy the world. The start of the book reminds me of The Andromeda Strain …This story takes some very exciting twists and turns. It is science fiction or at least I hope the majority of it is science fiction, it better be, really, they can’t be dumb enough to be doing this stuff for real, right? The SHIVA Syndrome by Alan Joshua is a treat for the fans of the techno thriller as well as fans of the paranormal…The novel is a complex and multi-layered work…If you like the novels of Lincoln Child, you will love this one…Read this novel.